Google continues to widen its portfolio of investment in renewable energy, as the tech giant announced Thursday that it partnered with SolarCity to create a new $75 million fund, through which the company will buy and own solar-panel generators on the roofs of several thousand U.S. homes. There will be no upfront cost to the homeowners. Google also committed $300 million to the new fund making it its largest renewable energy investment to date, but this isn’t the first time that Google has invested in residential solar. Earlier in February of this year, Google Ventures, Google’s capital arm, participated in a $25 million funding round for Clean Power Finance which was led by Kleiner Perkins Caufield & Byers and other Silicon Valley venture capitalists. And, in 2011, Google set up a $280 million fund with Clean Power finance. This initial fund is backed by Tesla Motors founder Elon Musk. “In most cases it’s very similar to the arrangement you have with your local utility, which finances the construction of a centralized power plant and delivery grid and then sells the power to you. Only the power that SolarCity provides is cleaner, and usually cheaper, too,” the company said. And that’s how Google makes a profitable return on its investment: customers who install these solar panels enter into a long-term contract to buy the electricity, which the panels generate, at a rate that is substantially lower than their current electricity bill to their utility company. 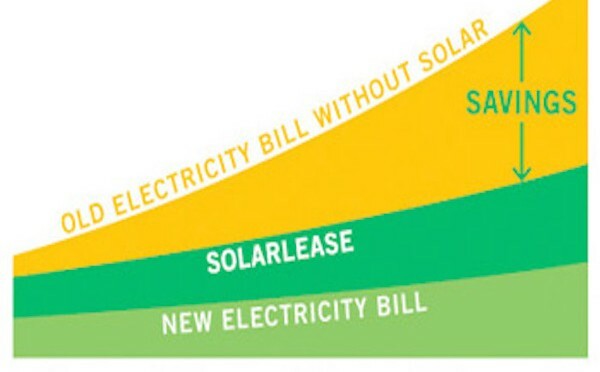 The installers, such as SolarCity, then sell the solar-panel systems to Google, who in turn collects a percentage of the homeowners’ monthly payments for the electricity. At this moment, the solar panel project will only be available to homes in California. Another tech giant that has invested big in solar energy is Apple. The Cupertino company Apple said earlier this month that it is investing $848 million on a First Solar (FSLR) farm to power its campus and headquarter in California, in a partnership with First Solar to build an1,300-acre solar plant in Monterey County. The solar farm will generate 130 megawatts of new solar power to California, which will be enough to meet the energy needs of about 50,000 California homes. SolarCity shares were up slightly on Thursday to $52.63. Google shares rose nearly 2% to $553.09.